Welcome to MitreSawZone.com, the home of mitre saw reviews. Our site will help you to choose the correct chop saws for your needs. With our mitre saw reviews, we aim to give you all of the information you will need to make an informed choice about which make and model of power tool to purchase. Let’s get started with a table of our top 10 choices of mitre saws of 2019 as a quick overview – click the ‘learn more’ link for a more detailed review of each mitre saw. 5 Why Buy A Mitre Saw? 6.1 What Do You Need To Cut? 6.3 How Often Will You Use The Saw? 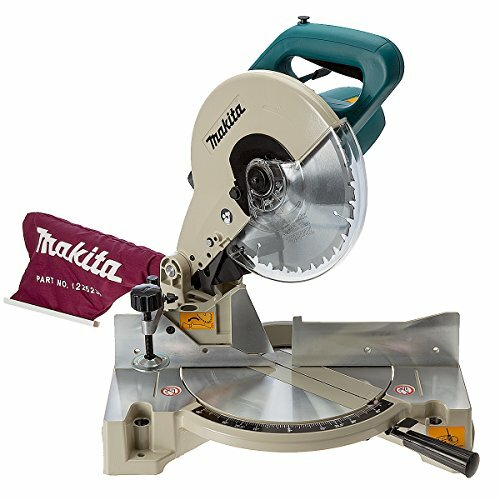 So, let’s get into the chop saw reviews with a bit more information on the products that we featured in the table above. We start off at our most highly recommended, but all of these saws have 4 to 5 star reviews from many customers, so all are very capable of performing the job that they need to. A new entry in the number one spot is the Einhell TCSM 2131. A robust and well built mitre saw that has a wide set of features for the majority of DIY users needs. The sliding mechanism makes it easy to get professional finishes on wide cuts like flooring and the large cutting capacity make it perfect for cutting lengths of timber for stud walls and sheds. The aluminum base is designed to last and be able to manage vigorous use on various jobs. The settings are all easy to set. You will quickly be up and running out of the box. There are not a lot of double bevel mitre saws on the market for this amount of money so this is a real must when it comes to looking for a saw that can be used for many different jobs. Unless you are looking for especially large capacity cutting or specialist features we think you should read our detailed Einhell TC SM 2131 Cross Cut mitre saw review. Occupying the number two spot in our top ten table is the fantastic Evolution Rage3+ sliding compound mitre saw. This model sits at the top for many reasons. It offers fantastic value for money whilst offering very high performance. The feature set is what you would expect to see on a much more expensive model, only just edging into the bottom of our mid range price category. It offers the capacity that many of the higher priced mitre saws feature, making it the perfect choice for the DIY or trade user. Evolution have designed the Rage 3+ to be a versatile mitre saw that will tackle most jobs that are thrown at it. Many of the saws in this price range have limited capacity and features, meaning that they will only be useful for smaller jobs. This model excels at some big cutting jobs giving you a fantastic finish and accurate cuts. When you buy this model, you can be certain it will also tackle larger future projects that you have not yet even considered. This really is an easy to use saw, the multi purpose blade allows you to cut steel, aluminium, plastic and wood straight out of the box, making this a brilliant all round saw for a wide range of tasks. The sliding mechanism gives a very wide cutting capacity for larger pieces of material like large floor boards, and the blade offers a deep cut that will tackle some pretty large timbers including fence posts. All of this might sound too good to be true, but it is backed up by many very happy customer reviews on sites like Amazon, giving it a 4.5 out of 5 star average review. The Rage 3+ is backed up with a 3 year warranty for all UK purchases giving you peace of mind that it will live up to all of the claims. A truly great mitre saw that we highly recommend, click here to read our detailed Evolution Rage 3+ sliding mitre saw review. Taking the number 3 spot in our mitre saw review run down, is the new Dewalt DWS774. This is a brilliant and modern sliding mitre saw that offers everything most of us need in a mitre saw at a price that competes with many of the new budget brands that are emerging. A brand like Dewalt has always been associated with the higher end more expensive tools. The DWS774 combines the Dewalt quality with value for money to break the mould. This saw is super portable and has been designed to be moved from job to job with a minimum of fuss. Lets not forget that most sliding mitre saw are big bulky tools. The small footprint of the DWS774 and the grab handles make this a great design. The new modern black and yeallow design really lift this model as well to make it look and feel like a brand new tool. The new XPS shadow line system really pushes this sliding mitre saw in front of much of the competition giving easy to use accuracy with absolutely no calibration. Easy to use straight out of the box, giving a proffesional finish. Any problems with this you can also use the Dewalt customer service that has moany years experiance of servicing the trade, this is the perfect buy if you are after great quality and versatility at a reasonbable price. 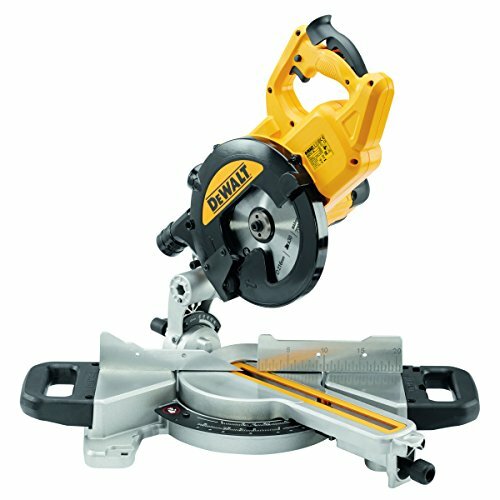 DeWalt DWS774 in our detailed mitre saw review. Let’s have a look at our first Bosch mitre saw review, at the higher end of the budget range this is an exceptional saw that is well worth a look. The brand says it all here, Bosch are well known for producing high quality power tools for high end DIY enthusiasts and the professional market. This Bosch chop saw is no exception offering really high build quality to make sure that you get the best possible cut from your mitre saw. If you are looking at a project that requires a quality finish and many accurate cuts the GCM 8 SJL is a great choice. Large scale DIY projects often require professional level carpentry tools. Bosch are a great brand to consider for reliability and quality. One big feature of the GCM 8 SJL is the improved dust management for clean and healthy use. This is so important if you are a regular user of a Bosch mitre saw. The rooms get very messy with all of the dust which is not good for you to inhale. With this professional machine it allows you to keep the work space as dust free as possible. The cutting capacity is a massive 31cm which means it’s good for most jobs, if you need bigger than this then you may need a different type of saw. This is a light saw for people that are carrying tools around regularly, usually it’s not just a mitre saw that you need to carry for a job! With all professional tools build quality is essential and Bosch have excelled over the years at bringing the most robust and hard working tools available, the last thing you want is to lose valuable time on a job when a saw breaks. It’s always worthwhile sticking to a trusted brand at this level of budget. The last thing to mention are the laser guides to give you the most accurate cuts. 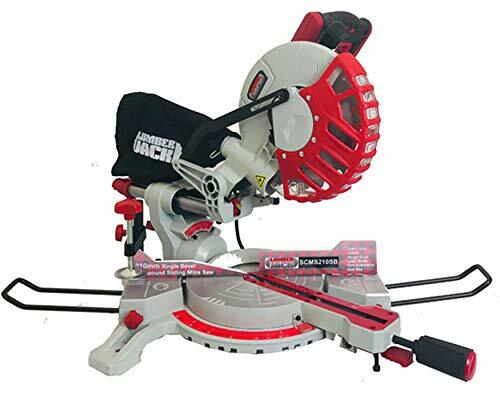 This saw comes highly recommended and with a name like Bosch this is going to be a saw that you can rely on for years and will work all day every day! Our full GCM8 SJL review will give you all the information you need. If you are looking for a good all round mitre saw then our Metabo KGS216M review is a good place to start. Sitting in the lower half of the mid price range you are getting a well rounded mitre saw for your money with great build quality. If you are looking for long term reliability in your woodworking tools than this is a great model. 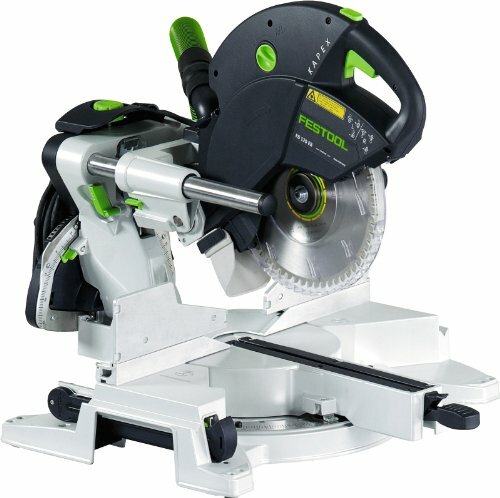 The Metabo KGS216M is a quality chop saw that is great for the keen do it yourself buyers, and also for the professionals that are not using it every day. It comes with a chip collection bag that helps to keep the work space clean and tidy. For working in small spaces or areas where there is furniture and carpets this is very useful. This chop saw comes with a sliding function for working on wider pieces of wood or plastics, making it a very versatile tool. If you are laying flooring or working with wider planks of wood the Metabo KGS216M will enable you to cut through very wide lengths of flooring material. Guiding the cut is easy with a laser guide. Visible from a working position the laser makes it easy to line up the cut without having to bend down while you are cutting. Accuracy with these saws is everything as a lot of the work that they are used for is for cutting visible pieces of wood to finish off the home. Nobody likes to have big visible gaps! The blade that comes with these saws is a very robust 40 tooth blade giving a nice, smooth cut. 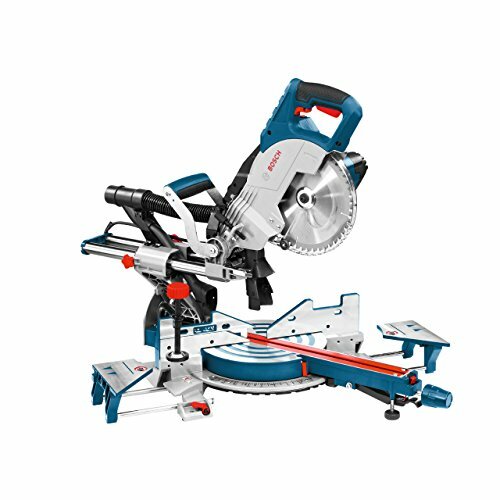 If you are thinking that maybe low budget saws may not be up to the job you require, but you do not want to buy a full professional unit, then this could be the one for you. Hopefully our review will help your decision. Here’s the full Metabo KGS216M review. The Vonhaus earns its place in the top ten reviews for one simple reason, value for money! This mitre saw will cover most jobs that a DIY user will need for a very small investment. 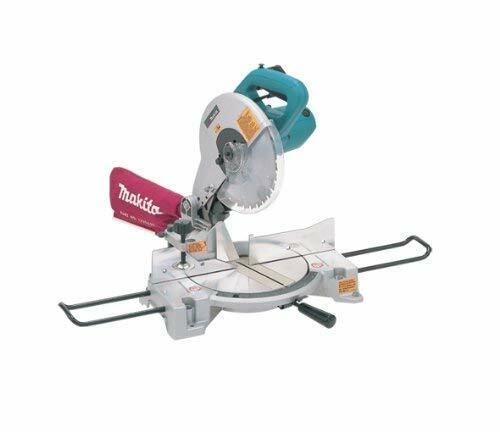 A lot of us need a mitre saw for a small project and may not need it again for a long time. This model suits that user perfectly, it is not a household brand or the biggest and most powerful model out there but it does the job in a simple and effective manner. The unit has non slip feet to keep it secure on a work bench for safety when cutting and also to keep the cut accurate. It has a maximum cut depth of 5.5cm, this is more than enough for most of us who are attempting to fit new skirting boards or other small bits of woodwork around the house.The one thing that is really important is the warranty. Just because you are buying a budget saw it should not effect the amount of cover you get. VonHaus don’t let you down on this with a free 2 year warranty. The saw has a powerful 1400W, 230V motor input which means it should be able to run for a long time and cut through hard wood. It has a durable and robust outer casing to take all of the knocks from being around a busy project where materials are being carried around and it also has a zip on dust bag for easy dust collection and disposal. All in all a great saw and well worth the money. 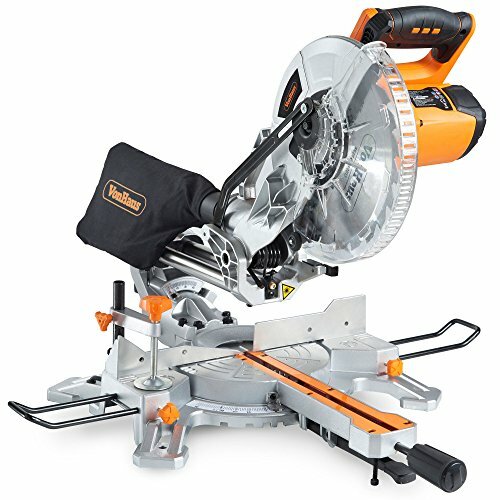 Click here to read the full VonHaus multi purpose compound 1400w mitre saw review. The Lumberjack SCMS210SB offers great value for a very feature rich mitre saw. For taking on the bigger cuts and complicated jobs like cutting grooves this is the saw to buy if you are on a budget. The name says it all, the Lumberjack is a saw built to deal with wood day in and day out with no problem. The feature set is pretty unbelievable for the price, many of them you would only expect to see on the mid and higher range saws. This saw has laser guidance for absolute accuracy in the cuts for the nice finish around the home. The Lumberjack mitre saw has a powerful motor which combined with the cutting depth makes it man enough for some really demanding jobs. A really nice feature is the adjustable cutting depth that allows for groove cutting as well adding to the saws usefulness. This is a nice looking saw that has a modern look and feel with the grey body and red trim. In a world of functional tools it’s nice to have things that look nice! Now into the detail, again it goes up in its cutting depth capability coming in at 7cm. Every time a saw cutting depth increases means it can take on more jobs. As with all of the saws on offer, the Lumberjack SCMS210SB offers great safety features that cover the blade allowing you to work in the knowledge that you are being protected at all times. This is an important for all newcomers to mitre saws as mistakes can happen! All in all a great saw that has many happy customer reviews and should fit well amongst a good set of woodworking tools. Highly recommended! Learn more about the Lumberjack SCMS210SB in our review. 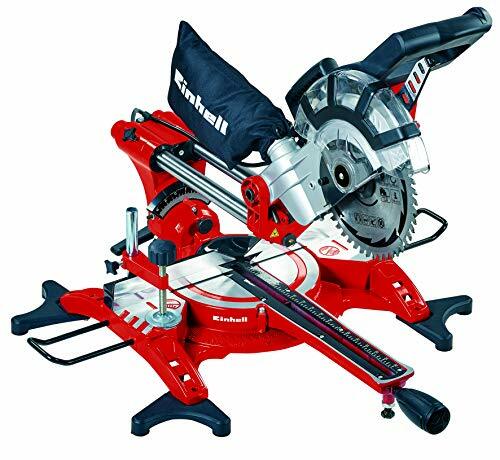 To have a well rounded top ten mitre saw reviews we had to include this absolute beauty. The Dewalt DWS 780 is the power tool of choice for a lot of professionals. This super popular model is an absolute quality saw and sets the standard in terms of giving the highest quality cuts. This saw is not for the DIY market, it will only appeal to the few that are experienced and want the best woodworking tools. If this is you look no further! Dewalt are a well used brand in the industry and come with a reputation second to none and have a big support network in terms of spares and repairs. This is so important with a mitre saw like this that is going to be used for long hours and for hard jobs. The cutting depth on this is a whopping 11cm allowing the saw to cut through large timbers for construction sites not just fine timbers for finishing jobs, really handy as it will cover the job of two saws. The bevel has a quick release stop setting to allow fast and accurate work, if you need to get through a lot of cuts while keeping a really high quality finish this is an impressive feature. Dust collection is managed well with this saw keeping the work space healthy and clean. The shadow line cutter illuminates the cutting area for easy use and the setting tools are fast and accurate. 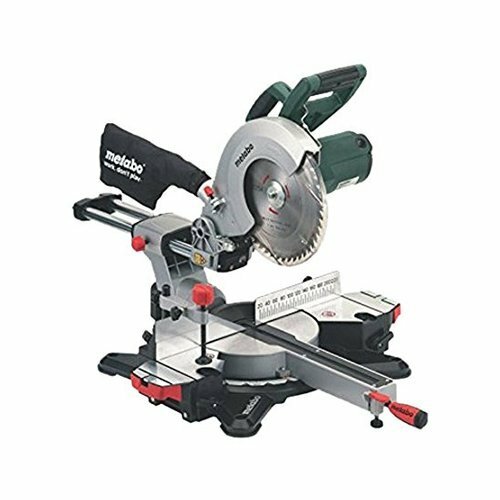 The sheer popularity of this saw is the highest recommendation we can give it as it is the choice of a large number of wood working professionals. Our detailed DeWalt DWS780 review contains even more information to help you decide on the best drop saw for your needs. Planted firmly in the mid range pricing this saw has it all. Makita are a power house in the tool world. 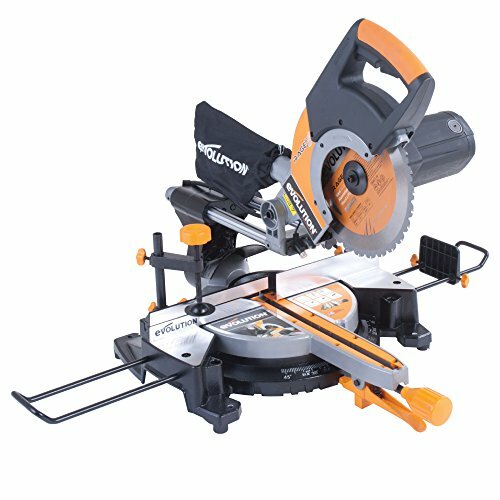 Offering a brilliant saw that has all of the features you could need combined with an affordable price for anybody. Makita have years of experience when it comes to building mitre saws and all of their products have this knowledge and experience poured into them. The LS1040 mitre saw aims at bridging the gap between the DIY enthusiast and the professional. This saw is the upgraded version of the previous highly acclaimed Makita LS1030 mitre saw. A trusted saw of many tradesman, this will make a good addition to your woodworking tool set. A big feature of this saw is the added rigidity of the body for really accurate cuts, any movement of the body even a fraction will lead to a less accurate cut and gaps in your joins. This is a key feature and something that all mitre saws buyers should think about. The motor is a powerful 1650 watt 240 volt motor that will be able to handle long periods of use without struggling. The saw has an improved dust collection facility that enables you to keep the workspace dust free and clean. Really important for long term use when you are looking to manage the workspace and keep the area tidy as you go. This saw comes highly recommended and the brand quality speaks for itself. This is a great value mitre saw that won’t let you down. Find out more about this great model in our Makita LS1040 mitre saw review. The experienced woodworker will be familiar with the quality of Festool joinery tools. This beauty is a real high quality mitre saw for professionals who want the best quality finish and a tool that can make their working day nice and easy. Festool is a brand that is not associated with the lower end of the market but when you start moving onto the real quality products they are a force to be reckoned with. This model would sit perfectly in any workshop. This saw allows for fine adjustment of the blade to within a millimetre of the front of the saw. It has a dual line laser guide to ensure the absolute finest quality cuts. Transportation is made easy with the Festool KS120 mitre saw as it has a lightweight and compact design. The saw can be packed up quickly and stored in the smallest space. The saw has good all important safety features for any lapse in concentration, it has a safety brake and robust blade covers. This saw is built to stand up to some pretty big jobs and can cut through timbers up to 8.8cm, this is a large cutting depth for a mitre saw and will make this a really useful saw on a lot of jobs not just the internal wood work jobs. If you are taking on a large house renovation job at home or are a professional that will use a mitre saw every day then this is the one for you, it is money well spent and comes highly recommended. In the mitre saw reviews above there is an option to cover everyone’s need and all of them are the best in the price range. The customer reviews for these products are brilliant and tell you everything you need to know about the quality of the goods. If you’re a home DIY enthusiast and want your to have perfectly fitting woodwork (perhaps fix those gaps and cracks in the skirting boards or make the door frames fit snugly in place) giving your home a modern expensive feel, then read on through the reviews. Similarly, if you’re a professional tradesman and need a little guidance, we’re here to help. With so much on the web about the different types of saws, and the vast differences in price range, we will be helping to summarise it all and guide you to the correct product for your needs. We all like to think of ourselves as DIY experts, but with so many different tools on the market for different jobs, a bit of specialist knowledge is often all you need to get on your way. We’d recommend starting with our top ten table, and then you can spend a bit of time reading through our review and information pages to get a feel for this specialist type of machine and its uses. Something you’re likely to notice on the web when researching mitre saw reviews is that you can easily find yourself looking at a model intended for the US market. We don’t recommend using Amercian models in the UK due to the differences in the power supplies (no to mention the physical plug connections themselves). A simple way to tell whether you’re looking at a UK or US model is the spelling. In the UK we use mitre saws, whereas in America it’s miter saw. Of course, if you’re looking at an online store, the currency should give it away too! Why Buy A Mitre Saw? Most of us attempt a DIY job not realising what tools we need to make the job smooth and fast. How often have you attempted a job that you think is easy but the finished product looks terrible and you need to start again? It’s a pretty common occurrence. Once you get on the internet to research the job with our mitre saw reviews, you soon find out that a good tool like a mitre saw will do the job in record speed and get the finish you want. That’s great, I know what tools I need now, but that is a can of worms in itself. Endless online DIY stores sell a lot of tools, but which one is for you? Well that’s where we step in and guide you through the process, leaving no stone unturned when it comes to the beginner and advanced mitre saw buyer. 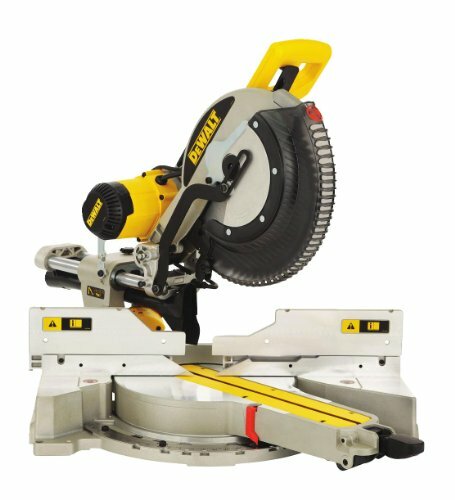 All of the major DIY shops and brands sell their own models of mitre saw, but are they any good? Below, we go over what we think are the best ten in our mitre saw reviews, starting at a budget of around £70 up to the professional £700 models. We cover everything from the beginner who will use the saw once in a blue moon to the tradesmen who will be using it daily. Some of us just want to buy one to have on hand whilst others might need one for a specific job. Okay, so you’ve read our chop saw reviews, now you are pretty clued up on all of the different features of the saws and you can see that the price range is pretty big. So the big question is which one to choose. It’s a lot of information to take in, so we will try and point you in the right direction to assess the correct purchase. Below, we are going to look at the different factors you should consider in a small mitre saw buyers guide. This will help you look at the factors you need to consider while reading each chop saw review. What Do You Need To Cut? Many of us turn to 110v drop saws when we are looking at taking on a job or have started one and have found that it is taking way too long. When you start looking around for a product, you should use our mitre saw reviews to check what sort of material you can cut with each model. Some come with a blade that is just for wood and others come with a multi purpose chop saw blade that will cut metals and plastics too. Often these tools are associated with only cutting wood but nowadays they are a much more versatile tool. For the DIY users out there, it is a good idea to get a multi purpose sliding compound chop saw as it will be very useful for a number of jobs in the future, not just the job are working on currently. It’s well worth looking at the Evolution and Bosch chop saws reviews for a wide range and great versatility. The chances are that you are going to be buying the saw for a specific piece of material that needs cutting. First of all, check the size of the material you need to cut, you can see that the depth does vary between the mitre saws so this has to be one of the biggest factors. As a rule of thumb, the larger the cutting capacity, the more expensive the model will be. The really expensive versions like the Dewalt DWS780 will cut some of the biggest construction timbers for some serious construction jobs, but the chances are most of us will not need that capacity. When it comes to cutting capacity, it is worth thinking about buying a sliding mitre saw, as they will cut wider pieces of material than the standard compound versions. These are often known as chop and draw saws. If you think that you will be using the saw a lot over the coming years then it is probably worth having a quick brain storm about what sort of project you have in mind. If you are going to be doing any structural work, it would be wise to measure up the timbers before your purchase. Many of us start to build up a set of power tools like this as we are thinking of doing more jobs around the house or have numerous projects that are being considered. It’s well worth doing some top level research into the size of the timbers that may be required in projects like interior house renovations or building a shed so that you are covered for many years to come. How Often Will You Use The Saw? This is a massive factor when reading our mitre saw reviews and deciding on your purchase. 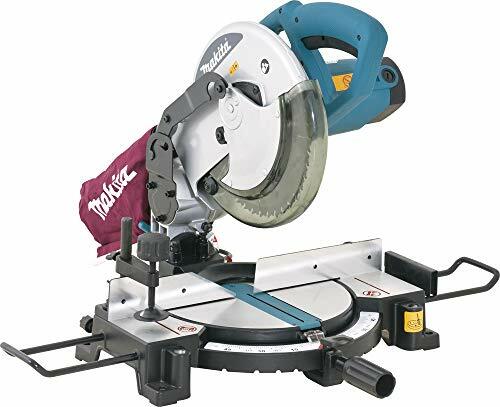 Is your compound mitre saw going to sit on a shelf and be used occasionally for light DIY jobs or do you think you will be taking on some big construction jobs like building decking or large areas of fencing. The more you will use the product, the more powerful you need the motor to be. If the saw will be in use for long periods of time continuously you will need a powerful motor for longevity. If you have a house that is going to have an extensive renovation job done then a more professional saw will be for you, whereas if you are going to fit a set of skirting boards and put the saw away for a few months you are probably best to go for a budget model. When the motor is working for long periods of time it puts more pressure on the motor, so the more power you have the longer it will last. The more powerful motors at over 1500 watts on models like the Makita LS1040 are built for heavy use and the motor will not be pushed to the maximum very often. Bear in mind that a cheaper drop saw with a small motor may need to be replaced quite frequently if used very heavily, so it may not work out to be that cheap after all. A great value model is the Dewalt DW777 240V 216mm cross cut mitre saw which has a very powerful 1800 watt motor for some seriously heavy use, but is also very good value. If you are worried you may wear out a cheaper saw, then you should seriously consider this model. Mitre saws are designed to cut pieces of material quickly to specific angles. All of the models in our top ten reviews are good at this job, but they do vary in terms of how complex a project you are working on. If you are working on jobs that need a lot of standard angled cuts like fitting decking or skirting boards then all of the saws will be fine. Most of the cuts need to be accurate and the angles good for easy and solid construction, but they are not going to be in view all of the time. As you go up the price range, you will start to find features like laser guides and double bevel models that will help you get absolute accuracy in your cut. For finer woodworking, it is well worth buying a mid to high range model that can give you the best cuts possible so that the projects come out looking great. If you are working on finishing woodwork like solid wood shelving, the finish is the key to it looking great and the higher end models in our review section will help you achieve that quality. This might sound like an obvious point, we will all say we want the best finish possible. All of these saws will give you a very good finish but think about it like this, if you are fitting MDF skirting boards that will be painted and small cracks filled then you want them to fit well but will not be overly bothered about the look and finish of the raw material. On the other hand if you have spent a fortune on oak skirting boards where there is no hiding any blemishes then you really will require a high quality finish. This is an important distinction and one you need to get right before you buy. The more expensive professional brands like Dewalt and Festool have far superior build quality to some of the cheaper models that ensure a fantastic quality cut. The angles can be set very accurately and the laser sites will help get the perfect cut. The cheaper models in our reviews will all do the job perfectly well, but it does depend how fussy you are. If you have not owned a power mitre saw before, you will be very surprised at the quality of the cut from any of the models in our top ten. When it comes to price range, we always advise people not buy a cheap mitre saw. It may look like a good deal but you may be replacing it soon. We would always advise that you try and buy the best model that you can afford, as it is a tool that you will find you use a lot. We have some brilliant budget models in our chop saw reviews like the Evolution Fury 3B but they do have limitations. For the extra few pounds you could move up to the Rage 3+ which is a fantastic saw and will last you a lot longer. If you are a keen hobby woodworker then it is a good idea to buy a model that spans the DIY and professional use, it may cost a bit more but will last and do all of the jobs that you require to a very high standard. The Bosch GCM 8 SJL 240V professional mitre saw is a bit more expensive but will be a great purchase for any project. If you really are only going to use the saw very infrequently then the budget models are for you, they will still do a great job and cover the basics very well for most DIY users. This is something that many people won’t have thought about but is a serious point. Different models are very different sizes and all require a certain amount of space to store them. If you are lucky enough to have a workshop or a big double garage then this not really so much of a consideration. On the other hand, if you live in a normal three bedroom house and are looking for a DIY model, then take a bit of time to work out what you can cope with. In general, the bigger the cutting capacity, the bigger the whole unit will be, as the blade will be bigger and the body will need to be a lot more robust to deal with the work of chopping large materials. Sliding mitre saws tend to be bigger than the compound chop saws as they need space for the sliding mechanism. 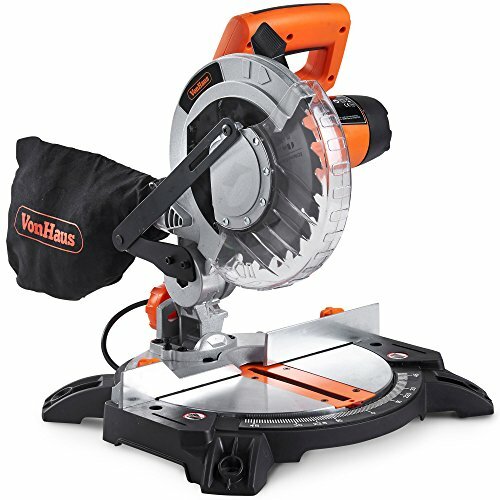 If this is a tool that will be stored on a shelf, there are some fantastic compact options like the VonHaus multi purpose compound mitre saw that are also great value. The Festool KS120 chop saw is an amazingly compact saw with new technology that allows all of the functionality of a big saw in a small space, but it is also very expensive and really good for professional use. Are you going to move the saw from job to job or will it be permanently fixed to a table ready for use? If you are going to be moving from job to job then you will want a light model with a good handle. That can be easily carried around and set up as opposed to a larger, heavier model that is going to be tough to move. For tradespeople this is especially important. If you are working in hard to reach parts of a site like a roof and then moving to the next site, it needs to be an easily portable model. The Dewalt DW777 is a classic design that is easily moved around and not too heavy. When looking at the specifications and features of a power tool in our review section, many of us tend to overlook the voltage that is required to power the tool. If you buy the wrong one, you are not going to have much joy and will probably need to send it back and get a different one for the job. There is a clear difference between 110v chop saws and the 240v models. The 240v mitre saws are powered directly from the UK mains power supply, this means you simply plug the saw in and it will work with no problem. This is definitely the type of power supply you should choose if you are buying a DIY mitre saw or if you are working on a lot of domestic jobs where the only power source is the mains. The 110v models are designed to work on a lower voltage that is supplied by a transformer. This power supply is usually associated with working on building sites and you will often find that you will only be allowed to use 110v power tools for safety reasons. If you need to use a 110v mitre saw from a standard mains connection you can use a transformer that will give you the required stepped down power. For most of us its an easy choice, go for the 240v model but tradespeople need to consider this a little more as transformers are heavy to carry around and it is another piece of equipment you will need to buy. However, if you will be working on a mixture of domestic and site work it may well be worth looking at a 110v model and a transformer. Many models are available with 110V and 240V motors, in our top ten mitre saw table you will see the Evolution Rage3-B 110v drop saw is a great value model that would be perfect for infrequent site work. This is a really good purchase that can be used in the home and on the site with the correct transformer. Many of us have probably used a hand mitre saw to do small jobs. Fixing small bits of wood can be done easily with a manual mitre saw. You may have also been considering a power mitre saw and would like to know if there are any real benefits to owning one. Well in short, there are so many benefits to owning a power mitre saw over a hand version, and to be honest not really many arguments in our eyes for owning the hand version apart from a small cost saving. How many of you have started a so called ‘quick’ job that involves cutting some material that turned into hours of cutting, only to get a very bad result. I did a few years ago before I started getting into carpentry. The correct set of saws (and other power tools) made my life a lot easier. I started with a power mitre saw and it is still one of the most used tools in the workshop. Even for a five minute DIY job it is perfect right through to the big project work like building stud walling and new sheds. One of the main reasons to use a power model is speed. All you need to do is plug it in and set the angles and you are away. It will cut through the material in seconds, letting you get on with the job. When you are working with a single bit of material, the speed difference may not be a great deal but when you are looking at cutting twenty fence posts and boards to fit along the fence, the speed difference will be vast. You can line up all of your pieces of wood, set the mitre angles and start cutting. In ten minutes the whole lot will be cut and ready to be assembled. Now imagine that amount of wood being cut by hand, it would take absolutely ages, probably hours which would make the whole job last a lot longer. Cutting materials with a hand mitre saw can sometimes be inaccurate. If you are not keeping the material firmly in place, it can give you an inaccurate cut very easily as it may move very slightly as the saw cuts. The power mitre saws in our reviews give super accurate cuts. Once the material is clamped into place and the angles set, the blade will spin very fast and cut in seconds. The chance of the material moving is a lot lower than if you are pushing and pulling the blade yourself. Using a hand saw is very tiring, especially if you are not used to it. If you have a big job to do, you will need to save your energy for the whole task, not just sawing the wood or metal. Most of us are not manual workers that are used to sawing, we are just doing a few jobs around the home and need an easy and effective option. Many hand mitre saws are very limiting in the settings they offer, they can give you good mitre angles but often they don’t allow you to use any bevel angles. Most power versions will have a single or double bevel option that enables you to cut at a vast range of angles rather than just the one mitre setting, making it a more versatile tool to have in the garage. One of the really handy things about some of the power chop saw models is that many models come with blades that will cut not only wood, but metal and plastic as well. If you think about all of the small DIY jobs you need to do that involve cutting different materials, you would be surprised at how often you would use a multi purpose bladed model. Things like cutting poles for wardrobes and fixing perspex covers will all be easily done. Most manual mitre saw reviews feature a blade that only cuts wood and needs a change of blade to tackle other materials. If you think you may not use it that often, then the hand models are cheaper but many makes like the ones in our Evolution mitre saw reviews are making some great DIY models that are very comprehensive and offer a lot of power for under £100. You may well find that the extra money is very well spent as you use the power chop saw a lot more often than you think. If you are having the dilemma, then we would strongly urge you to spend a little more and get a budget version from our top ten mitre saws table. A saw like the Evolution Fury 3B is a fantastic buy at well under one hundred pounds, and has a multi purpose blade and a single bevel action, allowing you to cut some very tight and accurate angles. Once you own one of these handy power chop saws you really won’t look back. Any job that involves constructing wooden frames will become a lot less daunting and a lot more achievable in a short time, the finish you will get will be great and it will really open your eyes to how easy carpentry can be. If you are thinking about tackling a house renovation or a carpentry project then we highly recommend you get the power version over a hand model as it will make your life a lot easier. Learn more in our mitre saw reviews section. When you are looking around online or picking up little hints from people on how to tackle jobs it can be pretty easy to get lost in jargon and slang terms for tools. Often a lot of different terms relate to the same tool. Power mitre saws are no different. They can often be referred to as drop saws or chop saws. All refer to the same power tool but many of the different models have very different features. So if any says to you “just use a chop saw” be sure to understand what angles you need to cut and what size the materials are before making your purchase. Chop saw is a term that is often used in metal work rather than mitre saws. The chop saw does the same job whether it is metal or wood and will cut the same angles. Cutting metal can be a far tougher job then cutting wood so these saws are very well used in metal work. The term drop saw really comes from the action of the tool. The circular blade is mounted on a frame that pivots which means the action to cut the material comes from dropping the blade onto the cutting area. In the UK, the term ‘drop saw’ does not get used a great deal, you are much more likely to hear it being referred to as a ‘chop saw’. Just remember they are both a power mitre saw! When you are looking through the top ten list or reading our mitre saw reviews, you have probably noticed that some models have a single bevel action and others have a double bevel action. There are some advantages and disadvantages to both so we thought we would run through the points to really think about when considering which one is for you. Firstly, what is a bevel cut? A bevel cut is used commonly for skirting boards and other finishing carpentry that is used around the home and for other joins. The saw is tilted to either the left or right side to a specified angle and will slice into the wood at an angle. The bevel setting enables you to cut into the wood at very specific angles as you can set a bevel angle and a mitre angle. Bevel angles are used in with conjunction with the mitre angle for a lot of very common finishing jobs around the house like cornices or crown mouldings and skirting boards. If you imagine cutting a piece of cornice that needs to meet at a 90 degree corner in the wall, the wood will need to cut generally at a zero degree mitre angle and a 45 degree bevel angle. Where the 2 pieces of cornice meet the bevel cuts will need to be going in opposite directions. This is where the bevel settings come in very handy and are widely used. They will accurately and quickly cut the pieces of material to the desired angle and length in seconds. If you are working on your own home, you will be able to finish your room like a professional. Below we will look at the advantages and disadvantages of both versions of the chop saw. A double bevel chop saw is one of the most versatile saws around, especially if it has a sliding function as well. These models allow you to cut bevel angles on the left or right side, you will be able to set the required angle on either side and quickly make your cuts. When you clamp your wood onto the fence, you can set the bevel angle on both sides so that you can quickly cut one piece then add another to cut on the opposite side bevel. The major advantage of this is that you can work quickly, for carpenters that need to cut a lot of pieces quickly and accurately with different angles it is great. For the tradesmen out there, these are really the most comprehensive mitre saws. Generally, a major disadvantage to the double bevelled mitre saws is the cost, they are usually very expensive and are not really in the DIY price range, although we have some in our top ten that do combine value for money and functionality. Another slight downside to the double bevel models is that they are more complicated and have more moving parts. This means there is potentially more that could go wrong with the saw and it will take a little more set up time. But this is a small downside, as once you are used to it you will be happy with the results. For the DIY or infrequent user, this is probably a bit overkill when it comes to buying a saw, you would probably be better off buying a nicer quality single bevel saw that will do most jobs but take a little longer. In our top ten we have a number of double bevel chop saws that we think are great in a number of different ways. The Pingtek Blueline combines value for money and all of this functionality to sit in our budget range. One of the only double bevel mitre saws in this range. If you are on a budget and want all of this functionality then have a look at this model or you could move up the cost scale and look at the Dewalt DWS780 for a brilliant high end double bevel mitre saw. Most of the mitre saws that are in the budget or mid range are single bevel models. These models are still brilliant saws and often give better quality for the money than having the double bevel version. The single bevel saws will cut all of the same angles as the double bevel saws, but may need resetting for each of the different angle cuts. If you are cutting 45 degree angles for cornices however, you can turn the piece upside down to get the joints to fit without adjusting the saw. The difficulty comes when you need to cut two different angles or have a very precise cut that needs to be a certain way. Most users of a mitre saw will say that the single bevel option works fine for them as the cost saving usually justifies it. For most users, the single bevel is usually more than enough for all jobs whether DIY or professional but if you are a carpenter or like to have tools that have the maximum capability then you should go for the double bevel models. Our advice would be not to compromise on quality for the double bevel option if you are on a budget. When it comes to using any power tools, safety has to be of paramount importance. Power saws are no different as they could cause serious injury if they are not well maintained and used properly. All manufacturers work hard to ensure all of their products have the best safety features, and make it a safe and effective power tool for the DIY and professional user. Below, we will have a look at some of the safety features you will find on most models, and what is worth looking out for when choosing your ideal saw. This might seem obvious, but the handle is an important part of the design of the saw and must be built to make it easy to use, without bending down or having to move to awkward angles to see what you are doing. The action must be easy to use to keep you and your hand well away from the blade and any moving parts of the saw. The blade covers are a very important part of the safety features. They need to be tough and well built to withstand a lot of heavy use. Most models have blade covers that shield the blade while it is in the up position and is not cutting, and moves out of the way to expose the blade as it cuts into the material. This is to make sure that nothing can touch the blade while it is spinning, apart from the desired material to be cut. Saying that, everyone must still take great care to keep everything away from the blade. Many people associate the laser guide with the accuracy of the cutting angles. It does help you to get a great cut, but it also has some safety implications which shouldn’t be ignored. If you are working in areas with poor light and are finding difficult to get a clear view of what you are working on, the laser guide will assist you in seeing what you are doing so that you don’t have to bend down to check that the cut is going to plan. Whilst keeping the area clean and tidy, the dust bag also has some real safety advantages. As it gathers the sawdust from the job, it will make the work area much cleaner and easier to see what you are doing, making it much safer to work in. If you are cutting a lot of material indoors, it is important to keep the air as clean as possible as the dust is not good for you if you are breathing it in all of the time. Many of the budget saws have a basic dust bag that collects small amounts of dust as you saw, but some of the higher end models have much more comprehensive dust management that can be collected into a large dust bag, or a dust management system in a workshop to keep the environment nice and tidy. Drop saws like the Bosch GCM 8 SJL have commercial level dust management facilities. When the saw is being used a lot, the specialist mitre saw stands are a great addition to your set up. If you are cutting long lengths of wood, it can be hard to manage them without a good solid stand to support each end and really keep the wood in one place. Often when the saw is working hard, it can move around a little as it vibrates on a normal surface. The purpose built stands will stop it from moving and keep everything in one place which is important for safety. Many companies like Evolution sell specific stands separately to go with the saws. As with the stand, the feet that are placed on the bottom of the mitre saw need to be sturdy and have a lot of grip. If the saw is being placed on a workspace that is not a stand, it needs to stay in one place and not move about. Specific stands are best for this but the feet should do the job to a point as well. The operation of the saw is a key design feature which needs to be done correctly for the safety of the user. The controls need to be in an easy to locate and operate place, which means that the user does not need to bend down or get close to the chop saw when cutting. The cutting area needs to be easily visible from a standing position as it is not a great idea to bend down to look at the material while you are cutting. For the professional saws, design is key as they are being used all day long on jobs that need to be done quickly and safely. Some of the models are built with a motor that is designed to run using a 110 volt power source. This is a mandatory feature on a lot of building sites and 240 volt tools are not allowed. This is because the electric shock that comes from 110 volts is a lot less than one that comes from 240 volts. The 240 volt models are perfectly safe using the mains power source as long as they are used in the correct way and attention is paid at all times. The motor on a power mitre saw is a very important part of the machine and is often a large part in determining the quality of the model you buy. The more powerful the motor, generally the longer it will last and the tougher the material it will cut. If you are buying a large capacity saw that will cut 3 inch by 11 inch timbers, it needs to have a motor robust enough to cope with it. But, the power of the motor is not the full picture when it comes to motor reliability and longevity of your chop saw. There are generally two types of motor used in mitre saws. The normal electric motor with brushes and the modern induction motors. The induction motors are more expensive but have a lot of benefits over the standard electric motor. Below we will look at how the two work and which is best for you. The induction motor is relatively modern technology and can be found in many high end electrical appliances that are built to last. Models like the Dewalt DWS780 that are built to be used for hours at a time over many years have an induction motor. The basic workings of an induction motor mean that the motor spins using electro magnetic force rather than brushes. The motor spins using the force and has relatively few touching and moving parts that can go wrong. These motors are much less prone to burning out then a standard electrical motor and should last a long time giving very consistent power with no problems. As these motors are powered by electro magnetic force rather then brushes they are also very quiet motors. This is a big advantage if you are using your mitre saw frequently or are working in a workshop that has a number of machines all running at once. There is no doubt that these are the best motors for the job, but the big downside is cost. If you are a heavy user of your mitre saw, it would be worth considering but but for the average user it will probably be a bit too expensive. The standard electric motors have brushes that can wear out, and many of the less powerful motors have been known to burn out after constant use, or attempting to cut a particularly tough material. If you have a standard electric motor it is wise not to try and push the saw to the maximum it can cut while it is working. Some of the models including the Evolution Rage 3+ come with spare brushes in case they need replacing which is a nice touch meaning the saw should last a long time. Many mitre saws that have been looked after and not pushed too hard have been working happily for many years on building sites and in homes with a standard motor with no issues. If you are a tradesman looking for a powerful mitre saw for a workshop then an induction motor is definitely the way to go but if you are working on a budget, then a standard motor will be fine. Try and buy the most powerful motor you can afford and look after it, making sure you are not pushing it too hard. It might seem that the power mitre saw was the most obvious power tool to build as soon as electric motors were invented. But no, it took a while for the first ones to appear. They arrived in the 1970’s and have then evolved with the modern sliding compound mitre saws appearing in the 1980’s. They have become one of the most used power saws around in carpentry with such a wide range of uses and ease of set up. You can plough through tons of cuts very quickly and accurately with no problem. For the modern carpenter cutting angles by hand would be unthinkable. With a big trend in renovating old homes and DIY carpentry, the latest models are designed to be very easy to use and accurate so that anyone can get great quality cuts, making their home and garden look great. The prices of the newer models is very cheap compared to the older versions. What was once seen as cutting edge power tool technology is now very cheap, mass produced technology. Many of the cheaper models are produced in large manufacturing countries like China, which makes them cheap and very accessible for the every day home owner. When we get asked the question ‘What is best mitre saw?’ we always say it depends a lot on what you want. There are many on the market that will perform various functions and are fit for different jobs. Our mitre saw reviews and information are aimed at helping you make an informed choice and buy the correct model for your needs. We have put together the top ten mitre saws for 2019 to give a good idea of what we think are a fantastic range of models that should cover 90% of people’s needs. This ranges from the first time buyer of a power tool right through to the wood work expert that needs a very high quality saw. We hope that by reading our site and looking at our reviews, you will understand the different aspects of potential jobs that you may want to carry out and match them to the best saw for you. The last thing we want is for you to end up with a tool which is not right. As new models come out we will continue to pick what we think are the best ones and add them to the site for your information. We hope we have given you enough information to make your choice. You certainly won’t be disappointed with any of the choices that you make! Good luck with your project.